You are currently browsing the tag archive for the ‘harvest magazine photos’ tag. Hurrah, our second issue has now successfully hit the streets after a bumper bash last Friday at the Order of Melbourne. It’s been another literary labour of love to bring out this Spring/Summer edition. We hope you love exploring the words and art as much as we’ve loved putting it together. It was another lovely crowd who came along and sweated it out on a steaming hot summer’s night. Thanks so much to every one of you who came along and supported us. harvest is so appreciative of your support, generosity and goodwill. Big cheers to Geoff Lemon, Nathan Curnow and Paul Mitchell for providing a bounty of spoken word performances; to Imogen Stubbs for designing the projections that accompanied the evening; and, to Jacinta Shanahan for being the launch snaparazzi. harvest magazine is also now a group on Facebook where we’ll post some more news and snaps. If you missed grabbing a copy of this sumptuous publication, contact us via writetoharvest@gmail.com or visit one of our fabulous independent stockists. So there it was, a launch or two for harvest in Melbourne. We made it, and quite a lot of you did too. The numbers swelled as after more than 12 months of juggling our fulltime jobs, part-time studies and sometime lives, we managed to bring our labour of love to publication. Thanks so much to Eurotrash for letting us drink and dance the night away on Friday 13th June and Readings Carlton for hosting us with warmth and wine on Saturday 14 June. We love that you came along to show your support for our endeavours, braving the wild wintery weather that decided to accompany our launches. We loved it so much that we’re even prepared to show ourselves in some random, candid snaps, enjoying the festivities and fun of Friday night with you. The weekend rundown included readings from Meg Mundell, Jack Cassidy and Andy Jackson, a toe-tapping spoken word performance from Geoff Lemon, a bountiful raffle and visual slide plendour from Imogen Stubbs. It was fast and furious but we hope to do it all again soon. So, here’s to the first issue of harvest! harvest is happy to announce our two launch dates. There’ll be a variety of readings and poetry sets, music merriment, and mingling. 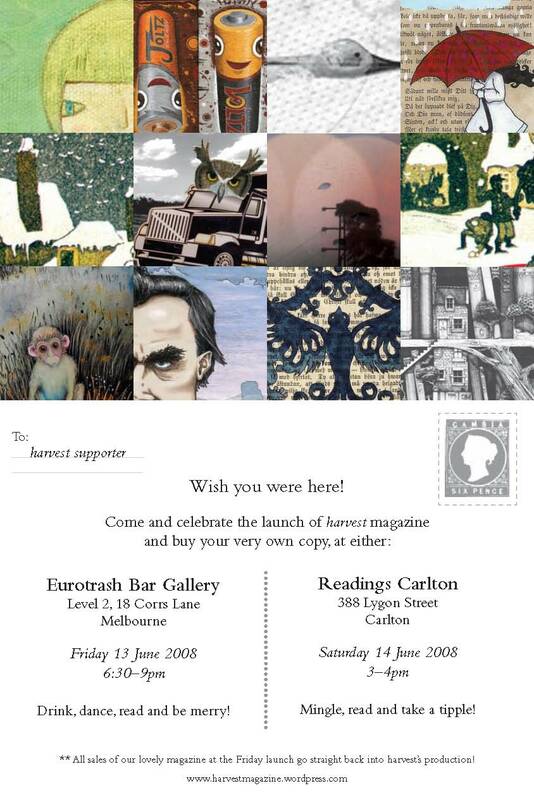 So spend an evening with harvest in the eclectic confines of the Eurotrash Bar Gallery or an afternoon browsing the shelves in the wonderfully warm surrounds of Readings Carlton. Choose one or both or even spread your time across the two. There’s much to hear as we take some time out to celebrate our brand new literary endeavour.